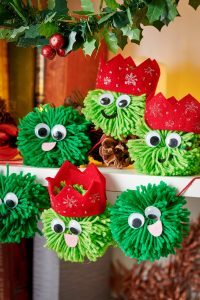 With Christmas just around the corner, what better way to get into the Christmas spirit than with some good old fashioned Christmas craft? 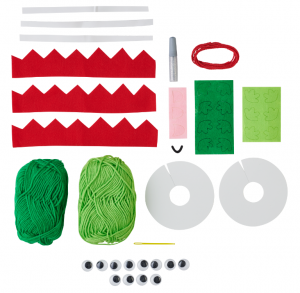 Craft is a great way to engage children and helps them explore their creative side. And, it gets them even more excited for Christmas – not that they need it! 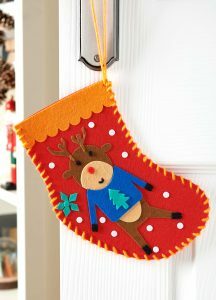 What’s great about Christmas crafting is that it’s more than just a momentary act; the decorations can be displayed year after year and create wonderful memories. 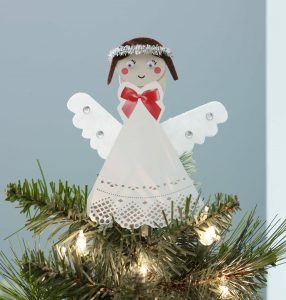 The kids will love seeing their decoration sitting proudly on the tree as well. What’s more, you can make it into a wonderful family tradition, crafting new decorations each year. Mix together the flour, water and salt. Add the water gradually – you can always add more but you can’t take away! 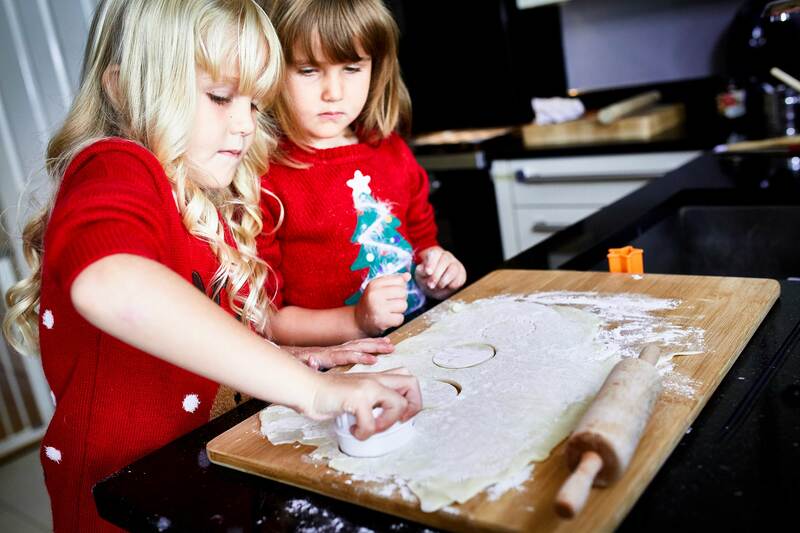 Mix away until you have a stiff dough – kids love this bit. Lightly flour your work surface and place the dough on it. Sprinkle more flour over the dough and start kneading. When it gets sticky, add more flour. Keep kneading for around 5 minutes. You’ll know it’s done when it’s firm and you can press into the dough and to leave a smooth dry imprint. Tip – if you want to make coloured dough, separate your dough out into separate balls and add small drops of food colouring of your choice and knead into the dough. Roll out the dough until it’s ¼ inch thick. Cut out your shapes and pull away the excess dough. Poke holes in the shapes for the string to go through. Leave them to dry or bake in the oven at 90 degrees Celsius for 2-3 hours. Next decorate to your desire! If you’re adding glitter we recommend glitter glue for easy application. You can use simple acrylic paint to paint your dried salt dough. Finish with lacquer acrylic spray. Leave to dry. Finally, loop the twine through the holes. We recommend twine for that rustic effect. Love ‘em or hate ‘em, Christmas wouldn’t be Christmas without a Brussels sprout! And if they’re not on your dinner plate this year, how about introducing them to your festive décor with our make your own Brussels sprouts garland? The garland is super easy to make and fun too – perfect for kids. If it’s not something you want to display with the rest of your stylish Christmas decorations, they’ll look great in the kids’ bedrooms. With self-adhesive felt pieces, full instructions and no scissors required, they’re perfectly kid-safe. 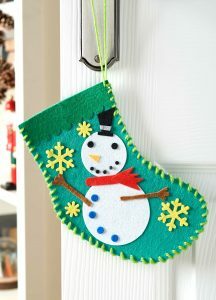 Every little one needs a stocking at Christmas, so what better way than having one that’s all homemade? 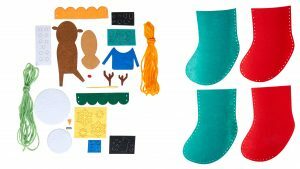 Our make your own stocking kit contains everything you’ll need to make the fun and festive decorations, and like the Brussels sprouts garland, no scissors or glue required! Hang these above the fire or at the end of their beds. Now this one is so simple to make. Just in case all your wooden spoons are needed for the festive cake making and gravy stirring, our make your own pack includes a wooden spoon as well as face felt, hair, wings, halo and extra decoration. The Santa face is so simple to do, so we can leave this one to your imagination. Just remember to use cotton wool for the beard and hat detail. To adapt this for Rudolph faces, you’ll need some brown paint for the face, and paper and scissors for the antlers that will stick out at the top of the plate. We hope these ideas get you all set for a crafternoon with the kids and helps them explore their creative side. 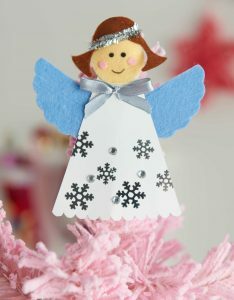 We’d love to know what decorations you’ll be making with the kids this Christmas! Tweet us @LoveWilko, visit our Facebook page or share with us on Instagram.